1- New: Template designer, enabling users to create templates that can be used to export customized 3D PDF files. 2- New: 64 bit support to handle very large and complex models. 3- New: Embedding in HTML, user can include the generated 3D PDF in automatically create HTML to make it easy to share 3D PDF files in the web. 4- New: Merging multiple PDF files, the plugin includes a new tool for merging multiple PDF files. Users can use the merge feature to merge a company’s front page –in PDF format– with a 3D PDF model. 5- New: Floating license support, ready to support teams of Rhino designers. 6- New: Command line integration, GUI free mode to enable scripting the process of 3D PDF creation inside Rhino. 7- New: Open After Export, the ‘Open file after export’ option, makes it easier for the user to view the generated 3D PDF file without searching for it. 8- Enhanced: Better 3D PDF illustration mode, with the new illustration viewing mode, share your models in a new better look, showing details like never before. 9- Enhanced: Better control over the generated 3D PDF file size, By utilizing Rhino’s Render Mesh, the user has control over the size of the generated 3D PDF file. To download a version which is compatible with Rhino 5 please visit this link for Rhino 64-bit and this link for Rhino 32-bit. 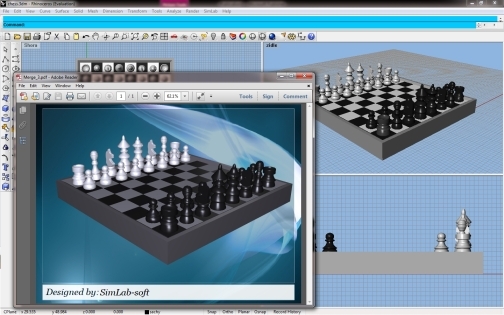 Sim lab's 3D PDF exporter is quick and easy to use. Exporter larger builds/models takes a little time, but works nonetheless. The render modes are great, as is the lighting tools. I have been using this more and more as a presentation tool and am very satisfied. Unable to receive the evaluation key. I was a little skeptical after seeing the inexpensive price for this plug in but it exceeded my expectations. 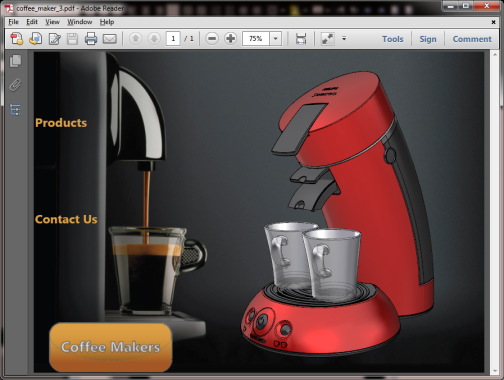 3D PDF files are the perfect way to communicate your 3D designs to your customers.